I bought it a month ago and am so happy i did. Its so comfortable and stylish ! I like this car seat. The straps are super easy to loosen up and tighten. I bought 2 of these for my twin grandchildren. So nice that we only needed to buy one seat and get 3 versions for growing kids. Customer service was very helpful when I'd misplaced and needed harness system for next grandchild. As he grew into the system. Big kids didn't mind sharing the seat with the smaller ones. On 4th grandchild to use them and they have held up and clean up well. I bought this as a Christmas present for a second car , we have not used it yet , but I can't wait till we do. My son is big for his age, when we bought this seat he was a tall 45lb 1.5year old! We needed something we knew would hold his weight as he grew. We had zero issues with the seat or the straps. Now hes 4ft 3in 76lbs at 6 and he still fits great in this seat. Only down fall is a bigger longer lasting seat it's a bit heavy and bulky but its worth every penny. Got this for my 6 month old for a great deal. Planned to save it until he was out of an infant seat, but I decided to use it in a second car. It's wonderful! So we'll made, really makes me feel like my child is secure. it's sturdy, gives lots of body support and is really nice looking. I was looking for a car seat that has a long belt because all my other car seat have belt so short that it's too tight for overweight babies. The height can be changed easily. Easy to install, at least for me. I currently use this carseats but, we recently got another to replace another carseat for my son. With baby #3 coming any day now, I'm moving my oldest to the back of the van and needed a carseat that was manageable and had easy enough buckling for my 3 year old to do by himself. This one is easy enough for my 3 year old and my 1 year old to buckle! It naturally reclines which my kids like as well. pretty easy to adjust straps, put in car and wash! I currently use this carseats but, we recently got another to replace another carseat for my son. With baby #3 coming any day now, Im moving my oldest to the back of the van and needed a carseat that was manageable and had easy enough buckling for my 3 year old to do by himself. This one is easy enough for my 3 year old and my 1 year old to buckle! It naturally reclines which my kids like as well. pretty easy to adjust straps, put in car and wash! I wanted to let Graco know how thankful I am for making an amazing car seat!! My son was in a rollover accident with my husband...He's five and was in the My Ride 65 LX. Their vehicle rolled front over back 2x and then slide approximately 50 feet down an expressway from speeds of 70+! My son did not have a scratch on him and was safe in the cocoon of this seat. All I can say is great work and thank you for making an amazing seat that kept my son safe! Easy to set up and install. Easy to get child in and out. Comfortable and safe. I have purchased 2 of these and we LOVE them! They convert easily from rear facing to front facing and are great for all ages! Every new parent needs to invest in these seats! This is an excellent car seat. We bought it for our 12 month old granddaughter because we babysit on a regular basis. The cushy head and neck pillow are really comfortable for her and are easy to adjust as she grows. The 5 point harness system is easy to use making it a breeze to secure, and remove our granddaughter from the seat. The seat is really big but the size gives us confidence that our granddaughter would be protected in a crash. Because of the size, we do not recommend this for a small/compact car but if you own a sedan or SUV we highly recommend this seat. This seat is as good as others Iv'e tried at twice the price. Easy adjustment and installation was a snap. I'll follow up in a month as to comfort aspects. This is a replacement for a smaller seat that my three year old granddaughter outgrew. I just bough it to day and I am so happy that my dougther love it. Love knowing my daughter is safe in our car and so comfortable at the same time! Makes for much more enjoyable car rides. I bought this seat 4.5 to 5 years ago for my daughter. She still rides in it today. It is a bit on the bigger side, so 3 across a back seat would be a stretch. Cost effective, simple features, easy to install, comfortable for baby, and fits in small car. Only down-side thus far, hard to make snug with latch or seat belt and once installed rear-facing the button to extend the harness is hard to access. We bought this a week ago and are beyond pleased with it. I can't believe this will be the last carseat we have to buy, but it is! And that's awesome. I'm amazed, though, that it not only converts into two other types of car-seat, but that neither comfort nor functionality are sacrificed to make this a convertible car seat. We will recommend this product for sure. I have had this seat for a year now, it is a heavy and well constructed seat. The cover is tricky to remove & put back again but the fabric stays true to size and no tears. We've used it rear-facing and now forward facing. It is a comfort to know that this unit will last us a long while. And it is great to have a cup holder right there. The 2 cubbies in the chair arms collect all kinds of things. Mostly animal crackers & french fries, but good for toys too I suppose. Perfect seat for a growing boy! We love the Nautilus 65 car seat! Our little boy is 2 1/2 years old with long legs! This carseat fits him perfectly and comfortably! Thankful we found this seat! Fits great for my daughter and car. We bought this about two years ago and still love it. It has grown nicely with our daughter since she was two. We love the two cup holders. It is very easy to install and have never had a safety concern. No complains here. This is a carseat which looks well made & has all the hallmarks of a quality product. Our grandchildren have both used it & feel very secure. I bought this seat three years ago for my grandson. I love the fact that it grows with him and I don't need to buy other seats. It is easy to clean and he loves the cup holder and the little storage areas. He can carry his little cars, etc. with him or put his little rocks or whatever he picks up while we are out. I bought this for my 4 month old son who grew out of his infant car seat and he loves this seat! He seems so comfortable riding in it and he falls asleep every time he's in it! Our first two seats for our daughter were Graco, so naturally we picked them again. This one arrived in the biggest box I've ever seen -- it was HUGE! If you have a small car, this is not the seat for you. Luckily, ours was going in an SUV and fit just fine. My daughter loves having the extra space since upgrading from her carrier carseat. Plus, two cup holders mean she can have a horse and a ball ride along with! (Does anyone actually use cupholders for drinks?) I wish the harnesses adjusted as easily as our other seat, but since it doesn't need adjustment often we'll be able to make it work. I received mine I. The mail today. It's a beautiful, but most impressive is the solid feel to the seat. It looks and feels expensive, but was very reasonable. It was simple to set up and very easy to adjust. My son seemed very content with me adjusting the harness while he was in the seat. I do recommend this car seat to those looking for a product that will grow with their child. this is comfy for baby but its very big! i hope it will fit in the cab etc. I bought this a few weeks ago and love it. Was very easy to install using the latch system. My daughter is rather petite and I was a little worried about the right fit for her. But this seat fits her well with the padding and I love the shoulder and buckle padding covers. Was a little heavier than I expected buy the seat will be staying in the car its in now. And now I won't have to but another carseat in 4yrs. I love the all in one designs that grow with the kids. Awesome seat I love it and she does too!! Thanks graco! This is the best car seat I have bought it's better than any other car seat out there! Instructions were easy to follow, lightweight to install, easy to install and just did a long trip and my child really seemed to enjoy it! I bought two of the car seats and love them. Only issue was trying to tighten the seat during first installation...great once tightened. Keeps baby in the rear-facing position up to 40 lbs. Keeps your forward-facing child harnessed up to 65 lbs. 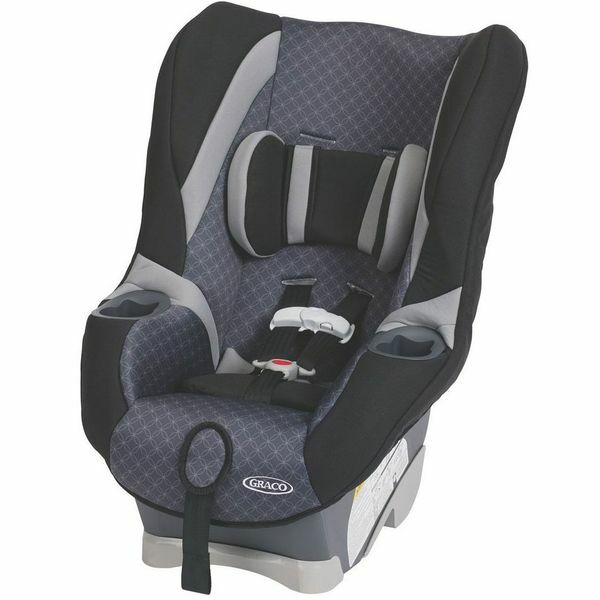 Weight: 15.8 lbsOverall Height: 26"
Rear-facing for infants 5 to 40 lbs. Forward-facing for toddlers 20 to 65 lbs. Help keep your growing child safe in this innovative convertible car seat. The American Academy of Pediatrics recommends your child ride rear-facing as long as possible, so My Ride 65 stays rear-facing up to 40 lbs. – longer than most other car seats in the US. Then, it secures your forward-facing child in a 5-point harness until he is 65 lbs. (the American Academy of Pediatrics recommends your child stay harnessed as long as possible). Other features like EPS, energy absorbing foam, side-impact testing* and removable infant insert help keep your child snug and secure on all his journeys. *Side-impact tested for occupant retention by the harness system.